The LETHAL STRIKE DVD is now available! Topic: Lack of standardization of fluid power components leads to numerous injury and non-injury accidents in the fluid power industry. A millwright with no formal training in hydraulics, suffered a non-injury accident as a result of an error made by a hydraulic distributor when crossing over a hydraulic directional control valve from one manufacturer to another. The error caused the hydraulic system operating a cooling tower fan to reach a terminal overpressure condition that resulted in a catastrophic hose failure. A millwright with no formal training in hydraulics was troubleshooting the hydraulic system that operates a large cooling tower fan. Not knowing how to troubleshoot hydraulics, he was trying to find the problem by process-of-elimination. He decided to replace the directional control valve. The new valve that he received from the supplier was not made by the same company that manufactured the original valve. Upon checking with the supplier, he was told that the new valve was interchangeable with the old one. In addition, he conducted a side-by-side comparison of the two valves, and found that mounting configurations were identical. He also noticed the similarity between the drawings (ANSI symbols) that were printed on the top of both valves. He went ahead and installed the new valve. He started the power-unit and prepared to run the valve through a test cycle. He selected the "manual" mode and activated the switch to the "fan-run" position. The fan immediately started to rotate, and quickly ramped up to maximum RPM. While the fan was operating, he inspected the valve for leaks. Everything appeared to be operating normally, so he placed the switch in "fan-stop" position. The second he turned the switch, there was a loud explosion from above. From where he was standing, he could not see what caused the explosion. He subsequently shut the machine down, and climbed the stairs to the top of the cooling tower. He inspected the hydraulic hoses and the fan motor. He noticed that the hydraulic hose had burst where it was connected to the motor. He initiated an investigation into the cause of the failure. The only logical explanation for the failure was that the system had, for some reason, suffered an overpressure condition. However, he could see no reason why this would occur. He checked to see if he had connected the hoses to the valve incorrectly - there didn't seem to be a problem. He then focused his attention on the new directional control valve, since it was the only component that he felt could have contributed to, or caused, the problem. During his inspection of the two valves, he noticed one basic difference between the old and new valves. The new valve had two nameplates affixed to its body - one on the upper half of the valve, and one on the lower half. The old valve had only one nameplate affixed to its body which was located on the top of the valve. The drawings (symbols) that were displayed on nameplates that were affixed to the top of both valves appeared to be identical. Not knowing what the "drawings" meant (he could not interpret ANSI symbols), he called the dealer for help. He learned that the "drawing" on the upper valve body represented the oil flow path for the pilot valve, and the drawing on the lower valve body represented the oil flow path for the main valve. When he gave the part number of the original valve to the dealer for crossover verification, he learned that the dealer had made an error, and supplied the incorrect valve. The original valve had a float-center, main spool configuration - which was critical in this application. The substitute valve had a closed-center, main spool configuration. Catastrophic failure was inevitable due to this oversight! When he checked the new valve, prior to installing it on the machine, he was satisfied that it was correct because the drawing on the top of the new valve was identical to the one on the old valve. Here's a simplified diagram of the system. Basically, the electric motor (1) turns the pump (2), which in turn produces flow. The electric, solenoid-operated, directional control valve (3) stops, starts, and controls the direction of the hydraulic motor (4). The hydraulic motor (4) turns the cooling tower fan (5). When the directional control valve is in the neutral position, the pump flow (port "P") is blocked. The pump is designed to destroke to "no-flow" when the oil flow path is blocked and the pressure builds up to a pre-determined level. Pay particular attention to the relationship between the "A," "B," and "T" ports in the directional control valve - they are all joined in neutral - THIS IS IMPORTANT! We will discuss why later. A switch connects the electric power to the solenoid, which in turn pushes the spool. When the spool moves, it realigns the flow passages inside the directional control valve, and connects the "P" port to the "A" port, and the "B" port to the tank return port "T." With port "P" connected to port "A," pump flow is directed to the motor causing it to rotate. Oil exhausting from the outlet port of the motor is directed to the tank. Bear in mind that there is a relatively high degree of inertia that is generated by the spinning fan. This dynamic must be taken into account when shutting the fan off. The inertia generated by the spinning fan will tend to continue to turn the hydraulic motor when the fan is shut off. This reaction will transform the hydraulic motor into a hydraulic pump - it is absolutely critical that the oil flow path from the motor remain unobstructed to allow the motor to rotate until the fan stops turning. In this illustration you can see the oil flowing from the hydraulic motor (which is now the pump), through the directional control valve, and back into the motor. The type of valve used in this application is made up of two individual valves and is commonly referred to as a two-stage valve. The upper valve (1st stage) is generally called the pilot-valve, and the lower valve (2nd stage) is referred to as the main valve. The pilot valve drives the main valve, while the main valve drives the motor. The spool configuration for the pilot-valve is always "P" port blocked, while ports "A," "B," and "T" are connected. This configuration is commonly referred to in the industry as "tandem center." The spool configuration of the main valve is dictated by the design of the system. In this system, it is coincidental that the main valve configuration is identical to that of the pilot-valve. How do the respective valve manufacturers identify their valves? They generally affix an aluminum nameplate to the valve, which usually displays the part number, serial number, and the symbol illustrating the spool configuration. The original directional control valve was manufactured by Nachi-Fujikoshi®. Nachi affixes a SINGLE aluminum nameplate to their valve, which is affixed to the top of the pilot-valve. The part number, serial number and an illustration of the spool configuration of the MAIN-VALVE only is shown on the nameplate. The replacement valve was manufactured by Vickers® Hydraulics. However, Vickers® affixes two nameplates to their valve - one is affixed to the side of the main valve, and the other is affixed to the top of the pilot-valve. The nameplate affixed to the side of the main valve shows the part number, serial number, and illustration of the spool configuration for the main valve, while the nameplate affixed to the top of the pilot valve shows the same information for the pilot-valve. The drawing on the identification plate affixed to the top of the original valve (Nachi®) showed that the "P" port was blocked, and the "A," "B," and "T" ports were connected. Remember, the nameplate affixed to the Nachi® valve shows the configuration of the main spool which in this case is the correct spool configuration for this application. The drawing on the identification plate affixed to the top of the Vickers® valve showed precisely the same drawing. However, the drawing on the nameplate affixed to the top of the Vickers® valve shows the spool configuration for the pilot-valve, NOT the main valve. Consequently, the millwright assumed that the valves were identical. However, in actuality, the Vickers® valve was equipped with a closed-center spool configuration, and this is what caused the accident. This illustration shows what happened when he selected the "fan-stop" position with a closed-center valve. The oil flow path from the fan motor was blocked thus obstructing the flow. The excessive pressure generated by the dynamics of the inertia in the fan driving the motor, caused the hose to fail. What can be done to prevent this type of accident? Dont allow untrained persons to work on and around hydraulics. Proper training will empower people to make safety-based decisions. Proper training will give people the tools they need to pinpoint problems safely and efficiently. They will replace defective components only, thus eliminating troubleshooting by exclusion - "process of elimination." As managers and supervisors, you are personally responsible for the safety of the people who are under your command. See to it that they have a certificate of training for every type of discipline that they might encounter in their daily work. You also owe this responsibility to their respective families. Attend, at the very least, a hydraulic safety training seminar, so you can see the inherent dangers associated with hydraulics. This will help you understand what maintenance people have to deal with every day. We dont think we are being facetious when we assume that you are currently neglecting hydraulic safety. Its not your fault that the fluid power industry, national safety organizations, the Fluid Power Society, and government and state safety agencies dropped the ball on hydraulic safety. However, you can make a difference if you have the will. Attend a hydraulic safety training seminar, if for no other reason than to be inquisitive. Decide for yourself if hydraulic safety should be a recognized occupational hazard. We challenge you to sit down with the "infantry" - the people in the trenches, the blue-collar workers, and discuss with them some of the challenges they face, because you, the manufacturer, failed to consider the impact something as simple as the location of a nameplate, might have on their safety. If you are not trained in hydraulics, regardless of how much on-the-job training you have, you are at risk - ask for help! 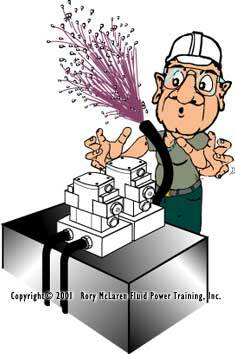 There are certain things YOU MUST KNOW about hydraulics to be safe. Put in a written request for training immediately. If you are turned down, refuse to work on hydraulics. Remember, if a person who has no training in electricity, is asked to work on an electrical system, that person has a right to refuse. These are rights we enjoy as free-spirited Americans - take advantage of them! If you attend a hydraulic training course and the instructor does not emphasize safety glasses, lockout and tagout, and tells you that it is acceptable to "test" hydraulic components to atmosphere, immediately ask for your money back - they ought to know better. Ask your supervisor to get the proper test instruments for you. You should have, at the very least, a flowmeter, pressure gauges, tachometer, and temperature gauge. If you don't have these instruments, don't work on hydraulics! If you follow a manufacturers written or verbal instructions about setting hydraulic valves, testing hydraulic components, etc., and you get sprayed with hot oil because the instructions tell you to "test" to atmosphere (to test without proper test equipment), consult your attorney - even though you may not have suffered an injury, YOU DID SUFFER AN ACCIDENT! NOTE - The company at which this accident occurred had on-staff safety personnel. However, this incident was not investigated as an accident. Had the hose failed in close proximity to the valve, the victim could have been seriously injured or killed. As long as hydraulics remains outside the boundaries of defined occupational hazards, the industry will continue to see these types of occurrences as "incidents" rather than what they truly are - "accidents!" We are often asked for data to support our accusations about the frequency that accidents occur in the fluid power industry. For over three decades we have accumulated our own data. However, it is our opinion that less than 1% of accidents that occur with hydraulics are investigated to determine root-cause. For any "accident" associated with a hydraulic system to be investigated, there HAS TO BE an injury, or a fatality. The assembly line personnel at a large manufacturing company experienced between 50 and 100 hose-end "blowout" failures within a three year timeframe. Not one of these failures was ever investigated as an accident. In December 2000, a mine worker was killed and his colleague was injured when a hose assembly failed and struck them. A full investigation into the cause of the failure was launched by the company's safety department, in concert with federal and state investigators - We rest our case! The accidents we report are real, and the victims are real. The safety guidelines we provide are to help companies and individuals work safely with hydraulics. All guidelines we provide are general, and are not intended for one specific hydraulic system or machine. WHEN YOU PURCHASE HYDRAULIC-POWERED MACHINERY AND/OR EQUIPMENT, WE HIGHLY RECOMMEND THAT ONCE YOU DETERMINE THAT IT CAN DO THE WORK YOU WANT IT TO DO, YOU THEN DETERMINE HOW MUCH SAFETY HAS BEEN BUILT INTO IT BY THE MANUFACTURER. IN ADDITION, WE RECOMMEND THAT YOU, WITH THE INPUT FROM YOUR OPERATORS, MECHANICS, ENGINEERS, PRODUCTION PERSONNEL, AND SAFETY DEPARTMENT, FORMULATE A LIST OF MINIMUM SAFETY STANDARDS FOR THE EQUIPMENT YOU PURCHASE. ALTHOUGH WE LIKE TO BELIEVE THAT MOST MANUFACTURERS ARE CONCEREND ABOUT SAFETY, SOME BELIEVE THAT CERTAIN SAFETY MEASURES ARE AN UNNECESSARY EXPENSE. WE FURTHER RECOMMEND THAT ALL THE SAFETY STANDARDS AND RECOMMENDATIONS THAT YOU DEVELOP SHOULD BE REVIEWED BY YOUR SAFETY DEPARTMENT, ENGINEERING DEPARTMENT, AND BY THE RESPECTIVE MACHINE OR EQUIPMENT MANUFACTURER PRIOR TO MAKING THEM POLICY - TOTAL SAFETY CAN ONLY BE ACHIEVED WITH A TEAM EFFORT. The Fluid Power Safety Institute does everything possible to insure that the information and drawings contained in these documents is accurate, and the procedures are deemed safe and reliable. However, these are general recommendations only and might not be applicable to all situations. You MUST have your engineering department and service department read these recommendations and make the necessary changes for your specific application. The Fluid Power Safety Institute is not responsible for actions taken by untrained and/or unauthorized persons. ALL hydraulic system service, repair, and troubleshooting should be done by trained, authorized persons ONLY.